According to a reliable source, Verizon is going to make changes to the majority of its More Everything plans this Thursday, February 5. The changes will include $10 discounts to most data options, a handful of new data tiers to choose from, and the $25 Edge discount starting even lower going forward at just 6GB of data. The full details can be found below. So the big change for most customers is going to be the $10 discount to most plans. Going forward, the 1GB data tier will be $30 instead of $40, the 4GB tier will be $60 instead of $70, and the 20GB tier will drop from $150 to $140. The 2GB and 3GB plans have been discounted by $10 as well. The second change has to do with the $25 discount that customers get on their monthly line access when the sign-up for Verizon Edge, which is their device payment plan. In the past, you had to be on a 10GB or higher plan in order to receive the $25 discount, but starting Thursday, data plans that are 6GB and higher will receive the added discount. If you are on a plan 4GB or lower, your Edge discount remains at $15 per month. 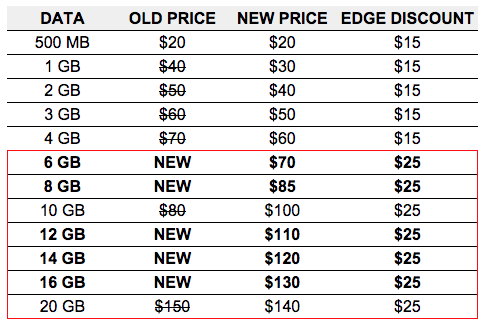 Finally, Verizon is going to introduce new tiers of 6GB ($70), 8GB ($85), 12GB ($110), 14GB ($120), and 16GB ($130). Android 5.1 is the Next Big Update, Still "Lollipop"